On Wednesday, we talked a little about what to do in Zion National Park itself. Today, let’s explore outside the boundaries of the main section of Zion Canyon. 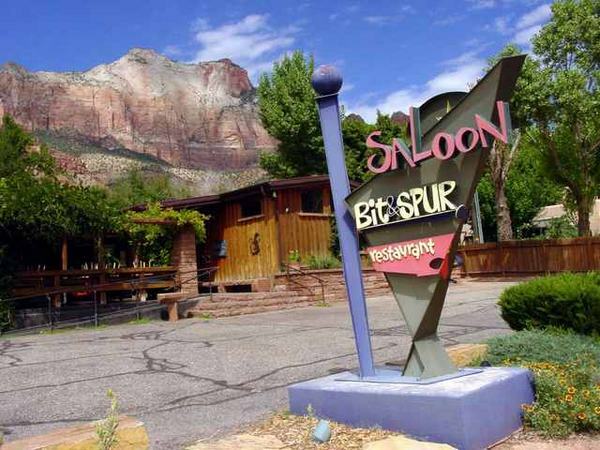 Staying in Springdale, on Zion Park Boulevard, is convenient and fun. The main street is lined with hotels, motels and private campgrounds to fit all manner of budgets and persnicketiness. 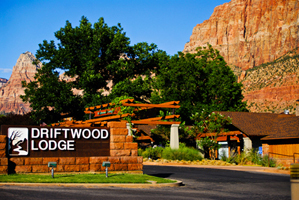 I have stayed at the Driftwood Lodge, and found the staff delightful, the rooms clean, and the views incredible. A major benefit of staying on Zion Park Blvd., however, is its proximity to the west entrance of the park, and the free shuttle that runs along the Blvd. and drops you off at the entrance (where you can switch to the Zion shuttle with no fuss). Zion Park Blvd. also has a wide assortment of art galleries (paint, photo, and sculpture), artisan shops, rock and crystal stores, and souvenir shops, so you can poke around to your heart’s content. Hungry? No problem. Check out Zion Pizza & Noodle Co., with mouthwatering pizza, pasta and beer (and next to a friendly outfitter so you can plan your excursion to the Narrows after you’re stuffed full of carbs). In the mood for something spicier? Stop by the Bit & Spur for margaritas, microbrews, Tex-Mex fare and pool. Once you’ve had your fill of the main area of Zion National Park (though that will never happen, so perhaps I should rephrase), it’s easy to venture farther afield. The other, less-visited section of Zion is Kolob Canyons, located a 45-minute drive northwest of the main canyon. Kolob has a very different feel from the main canyon. It is quieter, more peaceful. Arrive early, bring plenty of food and water, and embark upon the 14-mile out-and-back hike to Kolob Arch. You’ll first descend nearly 700 feet into the canyon, and then trek across barren desert, lush forest, and wild fields before reaching your destination 7 miles in. The entire round trip takes approximately 8 hours. It isn’t a particularly strenuous hike but it requires endurance and preparation, since the Utah heat can make you grossly underestimate your water needs. Also make sure to bring your snake-bite kit. Chances are, you’ll encounter at least one rattlesnake…but it’s a hike well worth the effort. Finally, for something completely different, drive the hour and a half to Bryce Canyon. 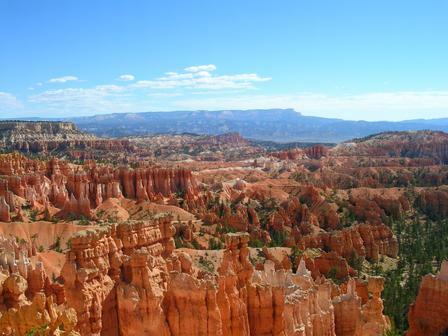 Bryce is spectacular in its own way, a giant bowl of orange and white hoodoos that will take your breath away. If you can manage it, plan to arrive before sunrise, station yourself at Sunrise Point, and surrender yourself to awe. Once the sun has risen, descend into the canyon and take the Peekaboo Loop. It’s only 5.5 miles, but because of the steep descent at the beginning and ascent at the end, it’s considered a strenuous hike. Early in the morning, the trail will be clear of the horse and mule riders, and you’ll be able to enjoy the way the sun hits the hoodoos and they appear to glow from within. **One note: roadwork on the Zion — Mt. Carmel Highway is about to start, and park officials are warning travelers to expect delays or seek alternate routes to get to Bryce from Zion, which would add significant time to the journey. You are a wealth of knowledge and I appreciate that! I am reading so much now about Kolob Canyons, I am thinking this may have to be my other day in addition to Bryce to be away from Zion. When you say arrive early, what time of morning are we talking about. Also, you say it is quieter, hiking out side of Alberta for the first time on my own, my preference is to be where there are others. I don’t need a whole lot of others around but would like some. I wonder what the likelihood of that may be in the Kolob Canyons! By early, I would say no later than 8. If you’re going to do the Kolob Arch hike, it’s a FULL day, so earlier is best. Kolob is a LOT quieter than Zion. I would guess you might run into one other person, if that, on the Kolob Arch hike. If that makes you uncomfortable, check in with the rangers and see if there are any guided hikes or groups going out.